It's been a busy month of presentations including RSA Conference 2010, ISACA Puget Sound, and the Agora. The Agora is a "successful strategic association that meets quarterly to bring together the pacific Northwest's top information systems security professionals and technical experts, as well as officers from the private sector, public agencies, local, state and federal government and law enforcement." At RSA and Agora I discussed tactics intended to compare security data visualization to strictly textual output generated by IDS/IPS. These discussions included details on AfterGlow, Rumint, NetGrok, and Maltego. At the ISACA Puget Sound chapter meeting I covered securing the company web presence (common security threats to your web presence and what you can do about it). This talk included details specific to the OWASP Top 10 and the CWE/SANS Top 25. The RSA presentation is here. The ISACA presentation is here. The Agora presentation is available upon request (russ at holisticinfosec dot org). There are PCAPS, scripts, and binary samples discussed in all of these presentations. Should you wish copies of any or all, please contact me. As I was last year, I am again pleased to report that the vulnerabilities I've been happily and responsibly disclosing and posting have resulted in 6th place on the list of Top Vulnerability Discoverers of 2009. Thanks to Scott Moore of the IBM ISS Frequency X Blog who compiled the list for 2009. I remain both pleased and disconcerted to find myself on this list and wish to convey a few thoughts on the subject. 1) First, a reminder that my work has focused entirely on vulnerable web apps and pales in comparison to the likes of others named on both the all-time list and the list for 2009. Congratulations and well done to you all. 2) My efforts resulted in what the Frequency X post indicates is 48 unique web application vulnerabilities in 2009. This again serves as a stark reminder of what a challenged state of affairs the development process is for so many web application vendors. May the SDL and its ilk prevail. 3) I will continue my discovery and reporting efforts with the intention of somehow making a dent in the statistics (unrealistic, I know). 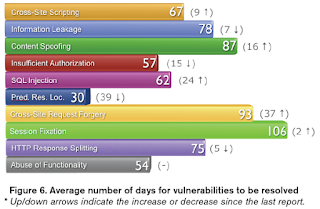 I focused heavily on cross-site request forgery (CSRF) issues in 2009 and was not surprised to find that the average number of days for CSRF vulnerabilities to be resolved increased by 37 days to 93 days. The above figure can be found on page 7 of the 8th Edition of WhiteHat's Website Security Statistics Report. I believe, as the report states, that much of the reason CSRF issues linger unabated is that "no one at the organization knows about, understands, or respects the issue." I can tell you from personal experience, I heard this many times in 2009. It should therefore surprise no one that CSRF is number four on the 2010 CWE/SANS Top 25 Most Dangerous Programming Errors. Hopefully, each application discovered and reported as vulnerable to this issue leads to a downward statistical trend in the likes of the WhiteHat report. I look forward to continued discussions of these issues with you, dear readers, and hope we can make a difference. means for sorting through the dizzying data and spotting patterns that might indicate intrusion…the presentation will focus on specific tools and methodology to aid you in establishing security data visualization practices in your environment. I’ll accentuate this theme as the crux of our toolsmith discussion this month while discussing NetGrok and After-Glow and additionally introduce timely sample analysis of the targeted Zeus bot attacks in early February against U.S. government institutions. The RSA presentation is in Orange Room 306 at 10:10 on Friday, March 5. If you're attending RSA, I hope to see you there. 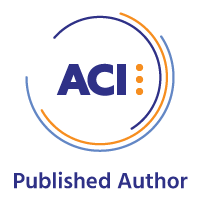 SearchFinancialSecurity.com just published my article regarding Financials and the need for software regression testing. This article cites Ameriprise as an example of a financial services provider who would benefit from improved regression testing and version control. 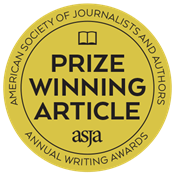 This article was actually written prior to the recent SQL bug I discussed involving Ameriprise, and is made even more interesting by discussion of a possible small, unrelated Ameriprise data breach in New Hampshire. I truly hope Ameriprise takes a close look at the suggestions offered and moves towards enhancing security practices on behalf of their consumers.